An active lifestyle makes us stronger and more productive. But there is not always time to visit the gym or go for a run. There is a solution to this problem. Today we present a FitDesk Desk Exercise Bike Review that allows you to combine training and viewing information, work on a laptop. Let’s dwell on the capabilities and advantages of this equipment. Compare 2.0 and 3.0 versions. We will answer frequently asked questions and summarize the results in the form of a total score. Both models have a special solid stand for a laptop. You can also place a tablet on it and watch videos or news on the Internet. You can use the site to host a journal or a work report. You can save time and keep yourself in good physical shape. You can easily assemble this equipment. For this, there is a detailed instruction. It describes all the components and the Assembly step by step. We recommend you to download it and read before buying. It is useful not only to build but also to customize for yourself. You will be able to adjust the position of the seat, steering wheel considering your height for a comfortable workout. The frame of this Exercise Bike is made of durable steel with a high-quality coating. Modern design-frame painted white, handles, seat and pedals dark. In addition, this equipment is very practical. After training, you can easily move it to the storage using the transport wheels. The frame of the simulator is folded and it takes up half the space. It is recommended to set a comfortable seat height and adjust the backrest before the start of training. This is done easily and quickly due to the convenient clamps. To adjust the difficulty of the exercise, there are 8 preset levels. Set the desired level and you can proceed. Adjustable armrest contains massage rollers, which allows you to get additional comfort during training. On the pedals, there are special clamps for the foot. So feet won’t slip off during exercise. Your current results will be displayed on the screen. The distance covered, training time and the estimated number of calories burned are calculated. To workout was not only monotonous for the muscles of the legs under the seat fixed rubber bands with comfortable handles. You can do the exercises at the same time. This will help to develop the muscles of the upper body, develop coordination of movements and increase the intensity of training. Both models deserve attention. They are equally qualitative and functional. When updating the model to 3.0, the wishes of users are taken into account. The new model has become a little lighter, but the maximum weight of the user has increased. There is no significant difference in functionality. There is no significant difference in functionality. However, the cost of the Fitdesk 2.0 model is about 30% lower. Therefore, we recommend that you keep this in mind. 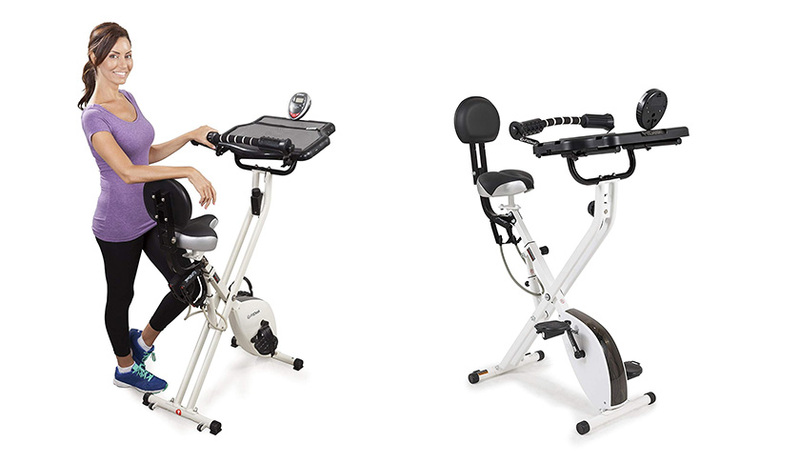 In General, FitDesk Desk Exercise Bike is a great for money. It is perfect for home use. Regular training will be useful and comfortable. You don't need a lot of storage space. Simple enough functionality, but it is enough for training.